As the library’s membership grows every year, the need to maintain its magazine collection outpaces the library’s budget. 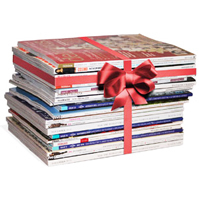 To meet this challenge you are invited to “adopt” a magazine by donating the cost of its annual subscription. Visit the Information Desk to view our “wish list” and to complete a short form to donate a magazine subscription. You can also make a donation online by following the “Donation” link provided below. Make sure to specify that it is for a magazine subscription and which title you wish to donate. You can find a link to our Wish Lists below to decide on a title to donate. We appreciate your interest in helping out the library.